Dimensional accuracy and sturdy construction are some of the attributes that make our Tractor Spare Parts highly popular. We are reckoned as one of the reputed Manufacturers, Exporters and Suppliers of Tractor Spare Parts. We have a well-equipped production unit that enables us to produce Tractor Spare Parts in bulk at a time. 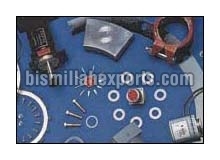 Obtain from us, small as well as bulk quantities of Tractor Spare Parts at the most reasonable prices. What are Spares? : Spare is part or a sub-assembly or assembly for substitution, that is ready to replace an identical or similar part or sub-assembly or assembly. It includes a component or an accessory. Care should be taken while purchasing spares. The faulty parts must be replaced by only authentic and genuine spares which are manufactured by reliable brands of the market. Importance of Tractor : A tractor is undoubtedly the soul of mechanized farming. The invention of this vital component revolutionizes the farming sector by its countless advantages. Higher Productivity : Since a tractor can perform many agricultural tasks at a time, thus increasing agricultural productivity, besides reducing land degradation. Multiple Operations : By using a tractor, we can perform multiple tasks simultaneously. For instance, we can plough the field, level it as well as do plantation job. Saves Time & Money : Tractor enables us to perform a task in a highly efficient manner, besides saving today's most important asset 'time'. It also increases the overall cost of operations, as the task of several people is being executed by a tractor.